ROCHELLE PARK, NJ— Hayden Book Company, Inc. has announced a new computer game series, called GAMEWARETM. The GAMEWARE series features high-quality, attractively-packaged computer games. 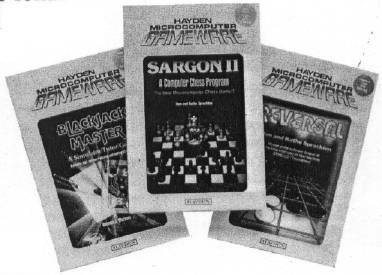 The first three games in the series are: Hayden's REVERSAL™, winner in the software division of the First International Man-Machine Othello Tournament; BLACKJACK MASTER™, a game that allows players to test their betting and playing strategies over thousands of games in minutes; and the famous SARGON II™ chess game. According to Steven Radosh, Hayden's Software Games and Entertainment Editor, "Hayden's GAMEWARE features the finest microcomputer games on the market, attractively packaged with four-color art, shrink-wrapped, and suitable for rack or shelf display." Radosh said Hayden plans an extensive promotion program for the GAMEWARE series. All three initial games in the GAMEWARE series will be available from Hayden in December 1980. For more information, contact: Steven Radosh, Hayden Book Company, Inc., 50 Essex Street, Rochelle Park, NJ 07662, (201) 843-0550. *Gameware, Reversal, Blackjack Master and Sargon II are trademarks of Hayden Book Company, Inc.